The day was a display of muscular Christianity; an opportunity for athleticism, fraternity and prayer. The men played tough games, putting their bodies on the line, and several seminarians sustained injuries from the day. Redemptoris Mater Missionary Seminaries and Holy Spirit Seminary, Parramatta co-hosted the day, welcoming the Seminary of the Good Shepherd, Homebush, Vianney College, Wagga Wagga, Holy Spirit Seminary, Queensland, Corpus Christi College, Melbourne and the Missionaries of God’s Love (MGL) Seminary, Melbourne. Jude, one of the key players of Corpus Christi Seminary, Melbourne was injured early in the day, during the second round against the MGLs. The intense rivalry between the two Melbourne teams was clear as they faced off on the field. VIEW: Images from the day here or scroll below. Holy Spirit Seminary, Parramatta drew against Vianney College, Wagga Wagga in the first round, nil-all. In Round 2, they drew one-all against Holy Spirit Seminary, Queensland, followed with a bye in Round 3. The morning games were unsatisfying draws for Holy Spirit Seminary, Parramatta until the Sydney seminary rivalry came to the fore in Round 4 against Good Shepherd Seminary, Homebush. Several religious based in the area of the Diocese of Parramatta were present, including Salesian Br Jeff and Br Bernard Mary of the Conventual Franciscans. Br Jeff is based at the Don Bosco Centre, St Marys and Br Bernard is on placement in Our Lady of the Rosary Parish, Kellyville. Michael Boudaher, a Maronite Seminarian at Holy Spirit Seminary told Catholic Outlook about some good patron saints for the day. “St Christopher, St Michael the Archangel, also St John Paul II and Blessed Pier Giorgio Frassati, a patron of the youth and because we are all here studying to be priests, St John Marie Vianney,” Michael said. With that level of spiritual assistance, there were no excuses for Holy Spirit Seminary to not come home with a convincing win. Fr John Armstrong from Good Shepherd Seminary prayed his rosary from the sideline. Was God on his side? “Well, last year I prayed two rosaries and we won,” Fr Armstrong said with a smile. Good Shepherd also had moral support in the form of competition legend Fr Daniel McCaughan, who also distinguished himself in international seminarian sports leagues while studying at the Pontifical North American College, Rome. Arv Clores, Physiotherapist from Winston Hills and childhood friend of Deacon Chris del Rosario was on hand to ensure the Seminary of the Holy Spirit team was in the best possible health. “Everyone’s pretty good, there’s nothing serious,” Arv said. Arv’s skills were crucial in the match between Good Shepherd Seminary and Holy Spirit Seminary, when Joe Murphy was injured and sidelined. The subsequent penalty resulted in a final minute goal, securing victory for Good Shepherd Seminary in the cliffhanger match. It was observed regarding the injury that ‘it is expedient for you that one man should die for the people, and that the whole nation perish not’ (John 11:50), alluding to Christ’s sacrifice. “We were defending well, we had many opportunities ahead but couldn’t follow through,” seminarian Matt Dimian of Holy Spirit Seminary said after the game. As in the 2018 FIFA World Cup, the English gift for football was not apparent, with the Ordinariate of Our Lady of the Southern Cross sadly absent from the field. Tom Green, captain of the Holy Spirit Seminary, Parramatta team commented on the value of the day. “It’s always a good opportunity to strengthen the fraternal bonds with seminarians around the country. The guys of Parramatta showed good hospitality and spirit, especially in following Our Lord’s words that ‘the first shall be last and the last first’,” Tom said. Hugo Chis, seminarian for the Diocese of Wilcannia-Forbes, is more of a Port Adelaide AFL supporter than a soccer fan but loved the atmosphere and had a great day. “There’s a great unity amongst all the brothers of all the seminaries, that we can get together fraternally, prayerfully, have a good game, meet new guys and talk and express how we’re going in our formation,” Hugo said. The day ended with a celebratory dinner at Redemptoris Mater Seminary, Chester Hill. 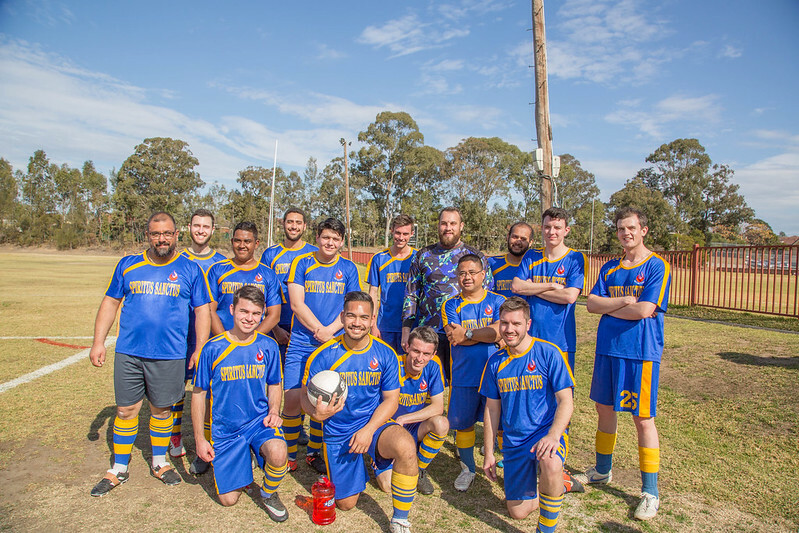 Next year’s cup will be hosted by Corpus Christi Seminary and the Missionaries of God’s Love Seminary in Melbourne.